A new bill known as S.B. 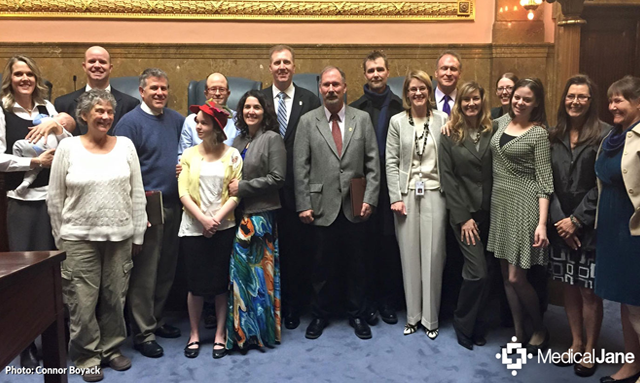 259 aims to legalize medicinal cannabis in Utah and is currently moving through the state legislature. In order to be voted on, the bill first had to make it out of the Senate Judiciary, Law Enforcement, and Criminal Justice Standing Committee. After hearing testimony from supporters and opponents, the committee voted 3-2 to pass the bill. It now moves onto the full Senate for a vote, which is expected to take place Monday, March 2, 2015. Dr. Michael Wilson testified before the committee about his professional and personal desires to see medicinal cannabis legalized. Before his turn, a woman named Tenille Farr discussed her experience treating her Stage II Hodgkin’s lymphoma with cannabis extracts instead of chemotherapy. She was pregnant at the time of diagnosis and could not use traditional treatments. After going to another state for treatment, her cancer stopped growing and became benign. Upon returning to Utah, the cancer started to grow again, and Farr now desires to reinitiate treatment. After speaking, Farr was questioned about the scientific support of cannabis for cancer by the committee. She stated there were studies from Israel as well as case studies showing cannabinoids directly treat cancer, and she has met people who are cancer free because of cannabis. As soon as her speech concluded, Dr. Wilson began with his story. Dr. Wilson outlined the need for a safe medicine like cannabis, which lacks the highly toxic side effects of many prescription drugs. He also lent great support to Farr by mentioning the existence of studies and anecdotal evidence supporting the use of cannabis to treat cancer. 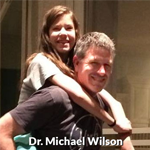 Surprisingly, Dr. Wilson then announced his daughter Raquel had glioblastoma multiforme, a Stage IV brain tumor, and wanted to treat her with cannabis. Indeed, numerous studies have shown cannabinoids may fight various gliomas. “We are excited, optimistic, about this legalization of medical cannabis in Utah, for my daughter to be able to regain some of her function and perhaps eliminate this tumor from her body,” said Dr. Wilson in his committee testimony. The impact of Dr. Wilson’s statements, which were delivered in a government setting, is truly extraordinary. It is rare that legislators get to hear about the direct anti-cancer impacts of cannabis, and they will surely look further into the issue now that they are aware of it. The following is transcribed from the Utah State Legislature audio recording of the February 26, 2015 Senate Judiciary, Law Enforcement, and Criminal Justice Standing Committee, 39:43 to 43:17. Good morning, I am Dr. Michael Wilson. I’m a board certified emergency physician, an M.D. As a physician, I wanted to speak to this, but there are other reasons also, but one of my more sacred duties as a physician is to alleviate suffering, and as physicians we have a wide range of options from which to choose. But many medications are highly toxic, very addictive, or severely damaging in their side effects. I believe that medical cannabis should be legal so that physicians have that option of recommending it to patients who might benefit from it. I appreciate the limitations and the restrictions that have been placed in this bill at this point to ensure that it is done in an appropriate and medically safe way. Many of my colleagues would say in private company that they support this type of legislation, however many of them also are hesitant to admit this publically for fear of negative professional consequences. But as a physician I am willing to speak out in support of this bill, and it’s not just professional interest but there’s also some personal interest. I have a 16-year-old daughter named Raquel, who this past summer was diagnosed with glioblastoma multiforme, a Stage IV brain tumor, highly aggressive and very difficult to treat. The standard chemotherapeutic and radiation therapy regimens provide a 5-year survival of about 10%, and about half the patients diagnosed with this die within 12 months of their diagnosis. There are some studies out there, Senator [Todd] Weiler asked an important question, there are not double-blind, placebo-controlled clinical trials, it’s been impossible to do those, but there are case studies, there are anecdotal evidences, that cannabis is effective in treating cancer, and lessening tumor load and perhaps eliminating cancer from the body. Raquel’s had multiple complications associated with her tumor, and even after fantastic medical and surgical care at Primary Children’s Hospital, she still has a golf-ball sized tumor in her brain, facial paralysis, difficulty swallowing and walking, and we are excited, optimistic, about this legalization of medical cannabis in Utah, for my daughter to be able to regain some of her function and perhaps eliminate this tumor from her body. We’re excited for this to be available to other families and individuals who battle chronic medical problems that are difficult to treat, and that cannabis has been shown to alleviate those symptoms. It’s not likely to be a panacea, it’s not going to fix all the medical problems out there, but it has been shown to improve chronic pain, chronic nausea, and lessen suffering in these patients. And so as a physician but more importantly as a father, I urge you to support this legislation. It’s imperative that physicians and families and individuals are able to consult together and explore their options for treatment and medical cannabis is going to be a very important part of this I believe going forward, and it’s a decision that ought to be left up to physicians and families. Thank you.